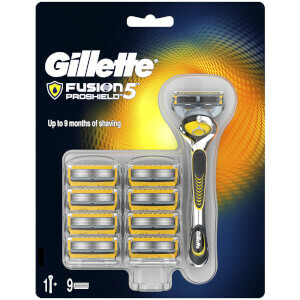 Gillette Fusion5 ProShield men's razor blade refills feature 5 antifriction blades for a shave you barely feel. With lubrication before & after the blades, it shields skin from irritation while you shave. The Precision Trimmer on the back is great for hard-to-reach areas and styling facial hair. One razor blade refill equals up to one month of shaves. Fusion5 ProShield mens razor blade refills fit all Fusion5 & Fusion5 Power razors. Gillette razors, formerly called Fusion ProShield. The blades are blunt and it hurts to use. Disappointed, have got through 3 blades in 3 days, hoping the next one will be be better the blades are expensive and not up to the job. Great blade that stops the nicks that I get from othe blade. For ease of use this razor is difficult to beat. Effortless shaving.